Many people wonder what happens to us after we inevitably pass away. Is there just nothing, a black oblivion without consciousness or thought? Or is there some afterlife, a place where our soul or spirit lives on? Many religions and philosophies dedicate themselves to finding out, and while we can’t say for certain what happens to us after we die, we do have a say in what becomes of our bodies once we do pass away. And, as it turns out, you (or at least your remains) can become a tree. The Capsula Mundi project was created by two designers, Anna Citelli and Raoul Bretzel. It is a new, more eco-friendly burial practice that is quickly becoming available. 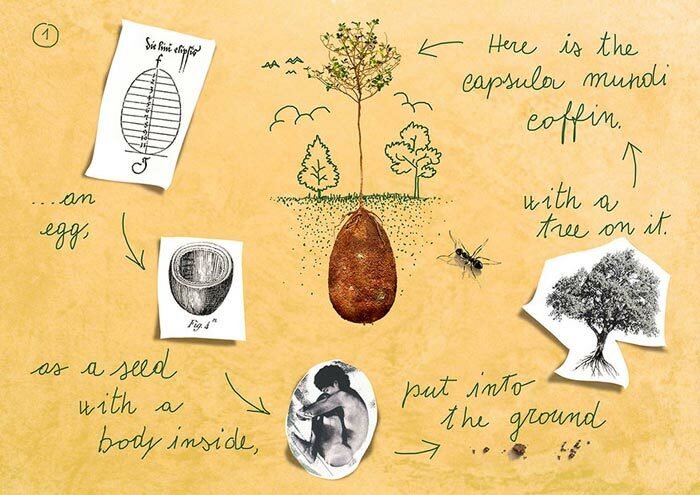 Essentially what Capsula Mundi does is place your corpse inside a biodegradable burial pod with the seeds of your preferred tree on top. Then you are buried in a special “cemetery” (land set aside for these burial pods) and the tree eventually grows by using the resources and nutrients from your body. So what is so great about this new type of burial? For starters, it is much more environmentally friendly than your traditional burial. Wooden coffins (and coffins in general) are only used for a few days for the sake of the funeral ceremony and after that they are essentially thrown away. That’s a lot of trees that have been cut down for a pretty limited use. Whereas the burial pod does the exact opposite and creates more trees–trees that will, presumably, last for many years. The pods are also completely biodegradable and will eventually become a part of the soil, providing more nutrients for the tree and the surrounding area. Not to mention, you could have an impressive tree that will continue to grow even more impressive as the years go by rather than a headstone that will wear down to a blank rock. A plot in a cemetery is, essentially, useless. This isn’t meant to disrespect any of the dearly departed or anyone who might want to have a traditional burial. However, you can’t argue with the fact that this type of memorial would be more helpful than a headstone. There is also the fact that a “cemetery” full of trees would be a lot cheerier and not nearly as depressing as our typical cemetery. Wouldn’t a person want their loved ones to be happier when they went and visited them?